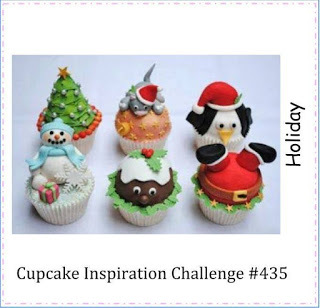 a new challenge is up at 4 Crafty Chicks! I'm the hostess this week and I'm late to my own party! GAH! I have to admit I'm a sucker for cutesy little critters on Christmas cards. 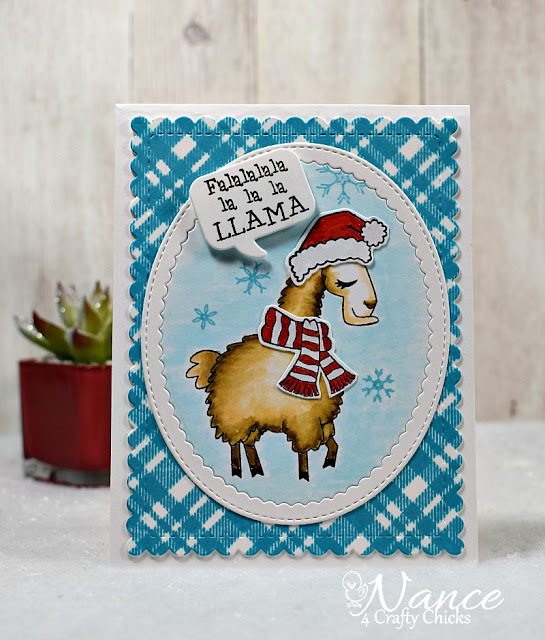 I used a llama from the stamp set, Little Llama, by Pretty Cute Stamps. I colored him with Zigs and Copics. I added some Wink of Stella to the hat, scarf and snowflakes. I colored around him with Copics and stamped a few snowflakes by Mama Elephant. The background is a plaid stamp by Catherine Pooler stamped in Fiesta Blue ink by Catherine Pooler. If you haven't already, stop by the Hen House and see what my fellow Chicks have created and our Guest Designer. Lots of more adorable critters to see! This llama is so much fun, Nance! And I love the way you've used the plaid background! The bright blue makes this even more festive! I sure had a lot of fun yesterday! What a fun challenge this week, Nance! LOVE your card - the plaid is awesome and this Llama is adorable!! !